In late June, Facebook announced they would be changing the News Feed algorithm to favor content from users’ friends and families, triggering a collective sigh (and maybe some choice words) among publishers, brands and marketers who rely on Facebook to boost brand awareness and generate referral traffic to their website and blog content. While Facebook admitted that they anticipated a dip in reach and referral traffic for some pages, many Page admins were probably already noticing a decline. Shortly after the announcement, BuzzSumo released data they’d collected after reviewing 25 million Facebook posts that the top 10,000 publishers has posted in the last year. 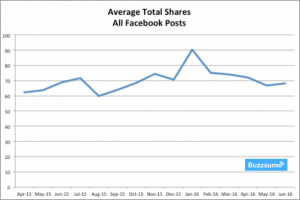 Generally speaking, the average of total shares were up, but BuzzSumo discovered that average shares for posts with links were falling. The bottom line? The type of content you post, along with the new algorithm changes, has a significant impact on reach and engagement, as well as the amount of traffic you can draw in. For brands and content marketers especially, it’s more clear than ever that posting links to your website or blog content can’t and won’t get you the results you’re looking for, but rather it’s time to embrace Facebook as a way to connect with your audience, encourage discussion, show your value and build a rapport, as well as drive some traffic. With that said, we’ve put together a few best practices along with some tips for boosting your the reach and engagement of your posts on Facebook. #1 – Put in the work to really understand your audience. After reading that, you’re probably thinking: “Duh.” While it may seem obvious, it’s also an important reminder we all need sometimes. Once we get in the daily grind, or as new initiatives roll out, or as some other new social trend comes along, we can lose sight—if only just for a minute—of who our audience is and what they really care about. Take the time to dig into your website analytics and Facebook Insights to uncover the types of posts that are really resonating with your audience. Look at the kinds of posts that are driving the most traffic to your website, as well as those that are garnering the most engagement on your page. Use that information to tweak your content plan, as well as your messaging. Of course, knowing that your audience can certainly change what they like, make sure you’re reviewing this data often, and making the necessary adjustments. Check out Facebook’s suggestions for getting the most out of Page Insights. #2 – Avoid using clickbait headlines in the content you share. Every publisher, brand or marketers has probably used a sensational headline to grab attention and get the click at some point. In my opinion, that can be OK if you can actually deliver content that’s equally sensational and valuable. But oftentimes that’s not the case—and it’s just clickbait. Facebook actually uses a system to detect clickbait headlines in content after a link is shared on the platform, identifying Pages and web domains that are consistently posting that type of material and reducing the distribution of those posts in the News Feed. Facebook suggests using headlines that are informative, clean and set appropriate expectations. Basically, don’t be spammy or misleading, and don’t just focus on the click-through, but rather use text to encourage engagement. Here’s an example that Facebook gives as a what-not-to-do. Read more about what Facebook has to say about clickbait headlines. Also, check out our post 9 Dos & Don’ts for Writing Compelling, Clickable Headlines to Draw Your Audience In. While hashtags have always been an important best practice for Twitter and Instagram, it’s been a little unclear whether they’re important for gaining reach and exposure on Facebook. So simply put, hashtags are definitely a great way to get your content discovered. Like Twitter or Instagram, when people click on a Facebook hashtag or search for a hashtag, they’ll see results that contain that hashtag, allowing them to find content on topics that interest them. If you’re looking to join a conversation, use popular hashtags to foster that discussion. If you’re looking to brand your content and posts, create your own hashtag that represents that topic and use it whenever relevant. Find relevant hashtags by searching Facebook natively. You can also use Hashtagify.me to get some ideas, but technically this tool is for Twitter and Instagram hashtags. If you do use a tool like this, run the hashtags you find through a native Facebook search to see how and if those hashtags are being used. When it comes writing your hashtag, if you’re using a phrase, capitalize the first letter of each word to make it easy to read, understand and remember, and avoid using spaces or punctuation. Also, make sure you understand the meaning of any hashtags you intend to use. While a hashtag may look like it represents a conversation or your brand, use a tool like #tagdef to learn if they’re being used for anything that’s a little more unsavory. Read more about what Facebook says about using hashtags. #4 – Utilize the mentioning and tagging functions to find new audiences. Mentioning and tagging other pages and users in your content is one of the best ways to amplify your posts. Not only do those you tag and mention get notified when you do so, but they’ll more compelled to engage on your post and share your post with their audience. 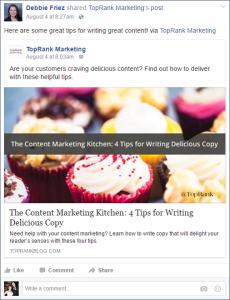 Here’s a recent example from TopRank Marketing’s own Facebook page. 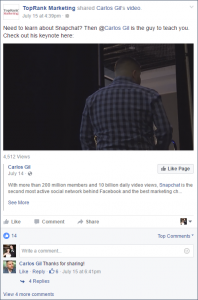 Carlos Gil is a brilliant social media marketer. We wanted to give him a nice little shout out, as well as share something valuable and interesting with our audience. As you can see, this post got more than a dozen likes and a few comments, including one from Carlos himself. Also, when it comes to mentioning, don’t let that stop in your original post text. If you receive comments from anyone, use the reply function to automatically populate their name as a mention and keep the conversation going. #5 – Consider native video. Most publishers, brands and marketers have known for a while that including images and video content in their posts is a way to drive engagement and give Facebook’s algorithm something it knows people are interested in seeing. But native video specifically can be the type of media post that gets great reach. When looking at it in the context of social media, native video is any video content that is created in or directly uploaded to a social media platform, and then auto-plays within the news feed. It actually lives on your Facebook page, removing the a barrier to interaction and making it easy for people to share so you can expand your reach. Upload videos that you’ve already created or utilize the Facebook Live function for more informal or sneak peek style posts. Here’s a great example from Microsoft. In just the first hour after posting, this video had more than 3,000 views, 8 shares and 54 likes. #6 – Encourage employees to share and engage with your posts. Your employees should be some of your greatest fans. Encourage them to engage on your Facebook page or share your posts to help generate some reach and give engagement some momentum. Send out a weekly reminder email to let your employees know about some of the interesting conversations or posts that are ripe for their engagement, or provide them with pre-written messages that they can copy and paste. Here’s an example of one of our own employees, Debbie Friez, in action. Have you noticed a drop in your organic reach and engagement? What are you doing to improve them? Tell us in the comments section below.